The best ad, the best targeting, the best funnel in the world can’t make up for a landing page or website that does not convert. Landing page optimization is something you probably aren’t doing but need to! That’s why we hung out with Suneet from CrazyEgg to go over what you should and shouldn’t be doing when it comes to landing page and website conversion optimization. Testing does not have to be hard or take expensive software. Install GA (Google Analytics – it’s free) on your website as soon as possible and make sure you set up the correct goals for key actions (lead, signup, cart, purchase). If you’re an eCom store, make sure you use the eCommerce tracking in GA.
Start with simple tests like. Using an explainer video or not? Using case studies on the homepage or not? Using social validation or not? Instead of trying to figure out how to use expensive software, just note the change in your Google Analytics account and look at the organic traffic 30 days prior and 30 days after to see if your conversion rate improved or not (the more traffic you have the shorter the test time). You only need 300-1000 visitors to determine a result when starting out. Use account averages and look at organic traffic as that is the most consistent. Heat mapping can point out some super easy wins. For example, if people are looking or hovering their mouse in a certain area of the page, make that the location of your CTA. If people are scrolling past something, remove it. Landing pages and websites are usually bloated and take away from the main CTA. If people are not scrolling down to your CTA, move the CTA up. Get inside the visitors minds and look at your website from their perspective. Use session tracking to watch what they do and where they have roadblocks or confusion on your website. Contact your customers and ask them about their experience with your website or product. You will learn a lot so ask an open-ended question and then listen. What were you looking for on our website? How easy was it to achieve X? What did you find difficult on our website? Make big changes, these will have a bigger impact on your conversion rate. Changing the color of a button is a test that you should only be doing if you have thousands of people clicking it a month. Provide 99% of your value for free and then charge for the last 1%. This is how people like Hiten Shah, Neil Patel, and Tim Ferris scaled their company. Check out CrazyEgg to help improve your landing page conversion rate and find Suneet at Linkedin (he deleted everything!). Check out Suneet’s book line (dream-village.org) that is educating children about social issues. Use VYPER to create viral giveaways, contests or leaderboard landing pages that are already fully optimized. Contests can help you build traffic, followers, email and customer lists. Check out an example. Sorry if the audio was a little off from the visual. Jack: Hey guys I’ve got Suneet here, the GM of Crazy Egg and we’re going to sit down for a little bit, talk about how to optimize your traffic. And how to make the most of your website and increase those conversions. Suneet has a huge amount of experience and background and all this sort of stuff. So he’s going to share some awesome ideas and things that you can implement with your website. Suneet it is so nice to have you here. How you doing? Suneet: I’m good. Thanks for having me. It’s great to reconnect. Jack: So Suneet and I actually met at a conference in Australia. Called Start Con. It was good fun down there. It was about three days. I think probably one of the biggest conferences in Australia for entrepreneurship and marketing. So, we decided to reconnect when we got back to the states. It was good fun. I wanted to start Suneet with a bit of background. Sort of like you are GM of Crazy Egg. How do you get there? And what’s so exciting about waking up every day and doing what you do? I know Neil Patel, has a bunch of companies, so I’m pretty interested to know how you guys got connected and why you’re doing what you’re doing. Suneet: Sure. I’m an old man. I’ve been doing this for a long time. I’ve been in a digital and marketing since 1998. Big companies, small companies are walked me through a variety of experiences to end up on the startup scene after having to do some private equity back stuff. This is just too harsh and cut throat and soul crushing for me with some of the experiences I had there. So, I switched over to startup world and then really SaaS. Been doing SAS before SaaS was SaaS. So, 2003 was sort of the first recurrent revenue model at Dun and Bradstreet and really fell in love with sort of subscriptions. Understanding subscription revenue in SaaS and B2B and the like. In terms of joining Crazy Egg. So my career has taken me through a couple of business units. I’ve sold a couple companies, raised a bunch of money total about probably $42.5 million across multiple businesses. I slowly worked my way up from VP of marketing at Chart Beat to CMO and head of sales at Live Intent to chief growth officer at Help Scout. I think the big thing that changed for me was, I had a realization a little while ago that I was tired of raising money and what that does to cultures and companies. I joined a company that was committed being bootstrapped and then for variety of reasons needed to go back to the well and raised some money. After that experience, I went back to wanting to look for bootstrap companies that is focused on profits, has a longer term perspective on the customer and can try and do some transformative things. I’d known Ethan (co-founder Crazy Egg) for a while and I had a conversation as I was looking for my next thing about a year and a half ago. And he was like; hey we’ve got this company Crazy Egg, have you heard of it? I’m like, yeah, I’ve been using it since 2010. He’s like can you help us take it to the next level? And I was like, yeah, totally interested. So, I came on as the GM of crazy egg in January of last year. A lot of it has been sort of infrastructure and cultural setting us up for this year of growth. What I mean as an example is when I joined crazy egg, we were six full time employees and about 18 contractors and now we are 28 full time employees. We have some good stuff ahead to share with a market that I understand well. Also, Neil and Ethan are just incredible owners and mentors and founders. Their commitment to the team and just getting it right and doing things that are helpful is pretty awesome. So they’ve been wonderful. They are great. Jack: Well Neil publishes so much great content so you can tell he is really in it for the long haul. Suneet: Oh yeah. And he is, you’ve nailed it. And he’s actually more and more a fan of people needing this. He just wants to give it away. He’s like, “I’ve made mine, I will continue to do well, but I just want to give it away and be helpful”. It’s funny because he’s one of his personal mantras, if you do enough good for people at some point karma will come back to you. He’s just focused on doing good stuff for other people. And I don’t think many people know that about him. Jack: Yeah, that seems to be a common trend among today’s top Entrepreneurs, I know that a lot of them have that same sort of mentality. Provide all the value up front, 99 percent of it and charge for that one 1 percent. So they are setting a great example of doing that sort of stuff that you guys all connected. Crazy Egg is definitely being one of the oldest, well first I suppose website optimization tools. So I’d love to jump into a few tips for those people wanting to increase their conversion rate and better optimize that traffic. What is the number one mistake that you see entrepreneurs making when they get started? What are the main things that they do wrong, that you just see time and time again. Suneet: You’re going to remember your flashback to my talk in StarCon. But I think the biggest thing that people get wrong is they assume you can throw money at the problem or just turn up the dial on seminar, email, paid social, like just do more, to get in the face of the customer and you’ll improve your conversions. I think the biggest mistake people make is they don’t actually stop and pay attention to their customers. I was on a CRO consult yesterday with a fortune 100 company and their head of testing. We had a really interesting discussion as the person was redesigning a specific page on the website and shared their results was able to lift conversions on a support page. And the first question I asked was, have you looked at the visitors? Have you thought about segmenting these customers? Did you look at the different cohorts of people that came to this page? Whether it was organic versus paid, whether it was internal referral versus not, whether it was mobile versus desktop. And again, you’re talking about a Fortune 100 company with an incredible technical DNA and their head of testing. His answer was no, like we didn’t look at all that and those are all great ideas. So it doesn’t matter where you’re at, I think the first thing people don’t do is just pay attention to some of the really simple things that folks can do. I also don’t think it’s their fault. I think they tend to see the tools that are created in the market that have made it hard to do this or made it seemingly hard so we can get people to pay us to do this stuff. I think there are really easy ways to get this out of Google analytics. There are a ton of great peer companies to Crazy Egg. And I know for a fact Crazy Egg for a dollar a day can help you really easily just observe and pay attention to your customers. At which point you find inspiration. I’ll take it one layer deeper. And to your point about what is the biggest mistake folks do? I think they trust their gut. They assume that either they are too small a company, there’s not enough data to make a decision, not true. I did a lot of that qualitative research and I know that if you pay attention to 15 customers and you observe them in their element, you’ll get to 60, 70 percent of the information you need to make a smart and informed decision. So most of us who started a business probably have 15 people coming to our website, like we should be able to observe them in their element. And on the flip side, if they have a lot of traffic, they just assume that the data tells the story which is, hey, we have tons of data. It shows that people aren’t coming here, they’re not clicking here. Let me move this. What they don’t do is go a layer deeper and pay attention to what happens sort of between events that an analytics dashboard would not tell you. They just look at the dashboard. They don’t try and get any color commentary on why. And as a result, I think people run bad tests and have bad ideas. So that’s some of the stuff that we see people could probably improve and do better. The key point there is it doesn’t matter how big you are, you can be a small company with a little bit of traffic or a large company with a lot of traffic. There’s balance to understanding qualitatively and quantitatively what customers do. And there’s so many tools out there that can help you do this in minutes. Just super-fast. Jack: Just on that, when you are running those tests. I get a lot of questions around how many tests someone can run at once. Are we testing too much? Are we testing the right or the wrong thing? What are a few ways that you can test the right thing and not spend a fortune on tools or experts? Suneet: So the first thing I’d say is test yourself. So I think too often folks outsourced the testing, so the person who is the expert on the customer experience or the product outsources the test to somebody who doesn’t have authority. And who doesn’t have data or doesn’t have influence to make the decision. So if you’re a small company and you’re the CEO, you may have a junior marketing person or somebody running the running the test. Have you given them the entire context that they need to understand your goals, your priorities, why you’ve built this company the way you’ve built it? So they feel equipped to make that decision. The other is, if you’re even 10, 15, 20 people, which we’ve heard a lot is they have outsourced testing to agencies. And in both cases what happens is the central knowledge about the test and the importance of what would work and what won’t. You end up having people running tests at the small margins as opposed to the big swing and the big idea. Most people aren’t testing. So I think that’s sort of the fundamental problem, just start and I think the benefit will pay off. So, if you’re not testing, just start and make it binary. Look at something and say is this the biggest opportunity? How do you detect the biggest opportunity? The simplest example is take a look at where your calls to actions are on your digital asset and take a look at where people are paying attention to. More often than not, if you haven’t done this before, you will see scroll depth and attention at certain places and you will see your key calls to action and information not perfectly aligned. Like that’s the easiest thing you can do. We did 400 CRO consults over the past six months and pretty much every customer we talked to, that was the first thing we told them. It’s like this, where people were paying attention, move your CTA here, even if it’s converting well for the people who are seeing it, you’re now having 20 percent more visitors and as a result you’ll see that happen. The reason I say that if you’re not testing, start with the easy things and the quick wins. You’ll gain confidence because the second biggest reason people don’t test is they’re afraid to get something wrong. Don’t be afraid to get something wrong, just pay attention and if it’s wrong, fix it or pull it back or change it. Then the other side of it is, people who are testing, I don’t think they’re taking big enough swings. I think too often people think of testing is like tweaking and they think you need to run AB tests to do this and all of a sudden everything gets pushed to the margin. At the end of the day you should be taking bigger bets. You have tons; usually have tons of historical data, so an AB test on a pricing page is potentially a good idea. But if that pricing page has been live for a year, you have enough information on that page, so just go live with the new page. See what happens. Those are the types of things I don’t think people do well enough or often enough. So again make sure the person has the authority, the information and the freedom to test. If they’re not testing, start and start with the low hanging fruit. Gain confidence. You’ll learn more and test more. If you are testing, you do have the data. Stop worrying about changing the conversion percentage from 2% to 2.1%. Step back and think of something transformative and the way you get that is qualitatively. A dashboard is designed to show you modest numerical changes. It’s not designed to give your insight to do something transformational. And that’s where customer research, user journeys, session recordings, all that kind of qualitative insight will spark the next big idea. Is that helpful stuff? Jack: Yes. A few examples of tests that we did that really moved the needle was some of these basic tests. We didn’t even run AB split test. We literally run the test for say two weeks and then compare before and after. One of these big changes was opening up accounts for free, instead of having customer enter a credit card on signup. It allowed way more people to test our tool and convert. You now create a VYPER account for free and then you enter a credit card later when you are ready to launch your campaign and start collecting leads. This is so different to everyone else charging 14-day trials. Or another one that moved the needle for us in getting a lot more volume and people using the product was adding a chat option to the pricing page. We did that and saw a good lift in conversions because we focused on the point the customer was at and were able to assist that. We do not have the chat on any other pages. The last example I’ll give is we didn’t have a basic explainer video of how the product worked. So we did that and it was just literally a 30sec video that we added above the fold and that actually helped us increase our sign up rate by almost 15%. So, theres were massive changes for us that we weren’t being super particular with an AB split test for two different pages or anything like that. We just did a similar amount of traffic. We usually choose the organic traffic because it’s the most consistent. It doesn’t take a data scientist to do all that sort of stuff. Suneet: I think that’s the thing which is if you just watch your customer, like watch the journey of the customer. Simple referrals, simple page tracking, you can see where they’re paying attention, where they’re not. You can see where they’re dropping off or they’re hesitating. And then your job is just to step in there and try and catch them. Try and re-engage them. That’s it. And your scenario is perfect. For example, at Crazy Egg some of the things we did were add a case study that we did for a third party. On our homepage, people give us a lot of flak because if you go to the Crazy homepage, there’s like nothing there. It’s just a data entry bar. We’ve tried so many different things and at some point where like people know us. They basically know what Crazy Egg is and does before they get there. So, we though, we’re going to remove all friction. There you just enter your URL, there’s a simple power statement of what we do and that’s the highest converting page we’ve ever had on our homepage. That’s it’s, we just looked at the data and thought, how do we remove friction? Similarly, you go through and you’re like, okay, people are coming to a signup page to enter email addresses or to enter to sign up. What can we do? Social proof. Let’s add a little bit of social proof to give people confidence in the process. And again we’re seeing these steps sort of improved. So that’s paying attention to your customers and just watched them go through the journey and as soon as you see the mouse, stop moving, you know you’ve screwed up. Like you have something to fix and then you can dive deeper on the data, etc. But finding that inspiration is important to all the stuff you talked about is great. And it’s amazing how many people don’t do that. What I love also is the fact that you didn’t AB test, it can complicate things. Like do you have enough traffic? Is it statistically significant? You start getting all this noise and everybody starts making you feel like it’s complicated. At the end of the day, just run the test. Look at the same baseline number of timeframe and or visits and see which one worked and may the better test win. It’s amazing I’ve been to places where we’ve run tests on pricing. And we had a pricing test win very clearly and the CEO and the head of sales said, I know this is what the price tests showed, but we’re going to raise prices for x because we feel like we can sell it. And that’s when you start to have like start to have challenges and it didn’t work. Jack: When I was speaking to, Peep from ConversionXL. The amount of traffic that he suggested you need to run effective AB split tests was something in the 10’s or 100’s of thousands a month. So, it’s really something that’s a little bit more advanced and most people don’t probably do it because of that. They could probably make way bigger improvements by doing those more simple tests. Suneet: So, real quick just to build on that from an analog standpoint, like one analogy that has always worked for me with my teams or with my customers. I worked in financial services a long time ago, so in the 2000’s with E-trade and Schwab and everybody was coming online and you had all this equity research being pumped out because the market was going to go to 20,000. The US market was going to take off in all these equity research reports. And what they tried to do was they tried to do was get you to buy their research. And by doing that what they started doing was ratings on equities and it started to looking like this. You’d have a strong buy, a modest buy, a weak buy a stronghold, a modest hold a week, hold a strong sell. And they took these and they started stratifying it so much. You’re think, what does any of this stuff mean? And a company came out and they said, you know what we’re going to simplify this. We’ve got three things. If we think a stock is going to go up more than 20% in the next 12 months, it’s a buy. If we think a stock is going to go down 20% in the next 12 months, we think it’s a sell. Everything else is a hold. They just really simplified everything, they raised the expectations and really simplified it and that’s what I think people should be doing from a testing standpoint is like what’s the thing that’s going to raise conversions 20%. And when you have that idea, if you feel like it’s a clear winner, go for it. Right? And ditto, clear loser, avoid it. Those are the things that we have to clarify the decision making. So people aren’t freaked out by all these other rules. If we make it really clear and raise the bar, it’s not about how this button performance by one percent, it’s about getting more people to add their credit card and get more people to sign up in the first place. That’s a big change, right? Jack: Yeah, well that’s a huge thing simplifying stuff because you go into most tools these days and you have no idea what’s going on until you’ve been using it for two or three weeks. Suneet: And a customer success manager to help you and you need an onboard. Like it just gets so heavy and nobody’s got time for it. We share some data from Mix Panel which said the average SaaS platform gets used 2.6 times a month. Elite SaaS platforms get used 7.6 times a month, which is like once or twice a week. And when you think of how much time people are spending in your product. It really changes how you think about product design and experience design. Jack: So, one other thing I wanted to ask you was, are there any brands or examples case studies that you have done? That had a really impressive increase in conversions based on a simple test you’ve done or an optimization that you’ve done? Suneet: Sure. I mean, I think we’ve got the biggest ones. So if I think of the CRO consults that we did, they are probably the biggest impact we made was on a large, a pretty well-known user testing site, sort of like a user testing platform and we focused on their blog. The big question we got was they’d had this content, it was out there for a long time and there were 2 challenges. The first challenge was the content itself just wasn’t ranking. So how do we fix this content, how do we improve it? It was basic SEO stuff we help them with. Which includes refreshing pages, which is updating, backlinking, sorts of standard things that you would do in SEO. The second thing we helped them do was understand where people were paying attention to the blog. And which was their most popular post. As a result we just sort of fixed their blog and traffic problems. We looked at where are people scrolling, where are they stopping, and what are they skipping? One of the things we’re able to do is update and transform the way that blog post was working. It’s got about 10,000 views a month so it was a pretty solid post. And then we also turned that into a referral for qualified visitors to their website. So that was the other thing that we talked about is too often people are focused on audience and not focused on recirculation. It’s hard for me to tell what the impact was because they weren’t measuring it in the first place. We actually introduced them really basically to this idea of qualified visitors, which is people that visit your website and key product pages. And they went from not measuring it at all to now it being the core metric they use to evaluate their blog. So again, it’s one of those, how do I tell you what the impact was when the baseline was zero? But you’re talking about a site that has 100,000 plus visitors a month who had no idea how that was being referred and driving traffic to their website qualified visitors. We turned it into, “this is how you structure it” and then “this is how you think about your blog as a way to drive conversions”. Transform the way they were thinking about it. So that’s like one example. Jack: Did they start recording that data for those using Google Analytics? What were they using to do that? Suneet: Yes, Google Analytics and the problem was they had a different account for GA.
And so how do you synchronize the accounts are basic things like pulling the accounts together. Use UTM tags to track. Again, we’re talking really basic things and this is the user experience website and this is a UX company. And these are the types of things that we often have to help these people do. I bet Jack, if you were to look at Crazy Egg you could give me 50 ideas and how I could improve conversion. And by the way, I’ll take all of them. It’s so much easier to critique somebody else’s experience than it is to look at your own because you’re invested in your own site. And that’s why I also say the best thing you can do is go out and like just talk as much as you can and you’ll get incredible ideas on how to fix these things. For example, a conversation started as a landing page consultation and we were like, well, you’re thinking about it the wrong way. Let’s look at the biggest opportunity, where do you have a lot of traffic? Where do you have a lot of traffic that’s not converting? How do we get that? How do you pay attention to those 10,000 eyeballs on that blog post and actually, get them to start paying attention to your blog? Think about driving contextual links, calls to action, banners, and popups to convert these. By just starting to identify opportunities that was a game changer. It was one of those moments where she’s like, okay, like I think I have enough. I have to stop, let me go get this going. So those are the types of things that we just love doing. Jack: Well that’s a good point actually. I think to add onto that, a lot of people don’t collect surveys from customers or talk to customers. Even install apps that do click tracking, session recording, that sort of stuff is a must. Because it’s really the easiest way to go about it, there’s obviously different levels of this. So picking up the phone, trying to get your top customer on a call for 30 minutes, asking them questions is a little bit harder than just obviously installing something and tracking clicks and that sort of stuff and watching sessions. Suneet: I mean look what’s really interesting about trying to get a hold of customers that in the past 24 hours I’ve connected with two customers in totally random ways. One person submitted a review on Capterra. And I got an email prompt and I emailed her back right away. And now she’s helping us do product discovery and exploration. She liked the timeliness and us paying attention, she’s like, “I can’t believe you responded”. And now we’re going to talk to her about the development of new products. The second thing was on LinkedIn, a young lady commented, I love this article, I love Crazy Egg and I just connected with her. Same outcome, I ended up introducing her to our head of product. She’s like, yeah, I’d love to. I’d love to tell you how my company uses this. So, it’s amazing how it’s just like leads. If you respond within 5 minutes The probability of converting a sale is so much higher. If somebody takes the time to interact with your brand and you’re paying attention. And you respond again to three sentences, like super-fast, but relevant. It’s amazing how surprised people are by those basic things like you can get those conversations pretty quickly. Jack: I’ve seen a lot of success doing that actually. The medium is changing, so when I respond or engage on Facebook messenger or LinkedIn messaging with someone I get a much higher response rates than if I was to shoot off an email or even just schedule a bulk email to go out with people being like, hey, we’re willing to incentivize you to do this call. You’re better off going down that narrow path and having an actual conversation I’ve found but you do need to keep an eye for those opportunities. It is very time consuming. Suneet: You are using a special chat tool. Is it Crisp? What was the name of the chat tool that you all were using? Jack: We were actually just using Manychat, so Facebook messenger. We were looking at using a chat tool and then we used to have live support chat on our site and then we just had way too much time wasting and it wasn’t effective. So we were like, okay, let’s only put the chat on key pages. So once you’ve obviously created your VYPER account and you’re in the product using it, you can use the chat or on the pricing page. We really wanted to streamline when we were having those conversations because maybe it was too early for someone and they just weren’t getting what they need to know fast enough. So instead of trying to hold everybody’s hand, we tried to improve the user flow and then only introduced that at key points and we found that it worked a lot better and we literally bootstrapped it and just used the Facebook messenger. Because now when they connect into that we can hit them up on Facebook messenger anytime you want now. Suneet: You get tons of great contextual data. When you shared that in Australia it’s fascinating because now you see that chat widget on every page of every site and it’s not like I think it’s just and it’s lost its luster. So I appreciated the fact that you had sort of pulled it back and made it work for you. And that way when you introduce it, it’s meaningful. Which I don’t think enough people do so I remembered that story. Jack: Yeah, well the other thing is when it’s just a submit form, they actually go and read the Q&A section first and find that they could solve their problem within the first line of a Q&A rather than waiting for us to reply to an email. So sometimes the user experience is actually better when you think, “hey, here`s a few Q&A things that might eliminate the problems you have” as opposed to waiting a few hours or up to a day for us to get back to you. You can solve this and continue on your journey right now. Suneet: Check yourself. That’s true. Jack: So there’s a lot of chat support and we have obviously started integrating that, which is really good. But we still have a few experiments we need to run around chat and customer onboarding and that sort of stuff. We are never there. Suneet: I know. Expectations change or everyone’s copycatted you and it’s become table stakes. So that’s the benefit of keeping on keeping on. Jack: We’re in a pretty niche area that’s very competitive too. Like viral marketing using contests and rewards programs, there’s so many of them. So you really need to pay attention to this stuff. Otherwise it’s very hard to compete. I’m a super stoked that you were able to jump on Suneet. And I’m glad we got to chat about all this stuff, it’s been super helpful for listeners I’m sure. We’ll probably wrap it up with some questions for you about where people can find you, what you’re doing these days or what your next projects are. Suneet: Sure. So where can people find me? I think the best place to find me is LinkedIn. At the start of the year I basically deleted Facebook. I’ve kept it up because I have a bunch of kid pictures up there. But on the first of the year as sort of like a spiritual reset, I shaved my head. The second thing was I deleted a bunch well deleted all, but immediate family on Facebook. So LinkedIn is a great place to find me. And also just sending the team at Crazy Egg an email, I’m in the queue. Not as much as others, but a couple of times a day. And then I will obviously take this opportunity to plug the fact that I also write kids’ books on social issues. So if you’re looking for a kid’s book on a topic like global water crisis, childhood cancer or bullying or materialism and sustainability, checkout dream-village.org and you can buy all the books on Amazon. Jack: That’s super important actually, teaching the adults of tomorrow. 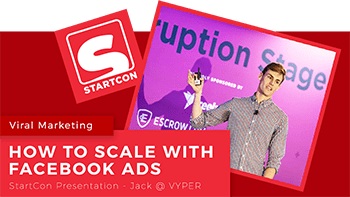 I remember your kids also got a plug in your presentation at StartCon as well. Jack: I was going to say, they’re going to be famous in no time. Suneet: They will. They deserve it all. They are wonderful. Jack: All right, well thanks Suneet. And if you’re watching this video and interested in more of this sort of stuff check out our YouTube channel about the growth hacking and our website vyper.io for building viral contests, giveaway and reward programs. Suneet, thank you so much, we got so much value out of this. We’ll stay connected.